There are Pokémon playing cards, so really, why shouldn’t there be Pokémon credit cards? 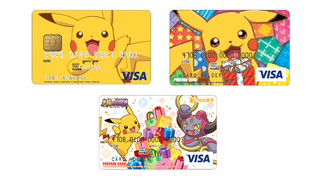 Today, a Pokémon Visa credit card was announced in Japan, along with two pre-paid Visa cards. One of the prepaid cards is limited edition and features Pikachu along with Hoopa from Pokémon the Movie: Hoopa and the Clash of Ages. Since there’s only three, it’s pretty easy to catch them all.